"The Arzel® Evergreen Zoning™ system is the first aftermarket zoning product that provides blower speed control based on zone capacity requirements. Controlling Indoor Air Quantity (volume of air delivered) is vital for complete comfort and Indoor Air Quality. Since Evergreen controls the volume of delivered air, it virtually eliminates the need for an expensive bypass damper while it maximizes comfort and IAQ. 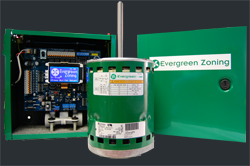 Evergreen Zoning™ is the industry's most energy efficient zoning system marrying the most efficient ECM technology with the ability to deliver the right volume of air to only the areas that need it. Evergreen is the solution you should be offering your customers whether they are looking for improved, more economical IAQ solutions or to enhance humidification and dehumidification performance as part of their overall comfort system. "